More Paintings for contemplation and inspiration! ‘The Adoration of the Shepherds’ is a work of blazing, visionary brilliance by El Greco who had the artistic bravery characteristic of genius in all ages. A painting, more accurately the the modello (a sketch shown to a patron for approval of the composition) for the altarpiece painted by Rubens for the convent of the Dames Blanches, Louvain now in King’s College Chapel, Cambridge. There is a wonderful humanity in this work. Though the event depicted was of universal importance it was witnessed, experienced, by, ‘ordinary’ men and women (and let us not forget animals as the peering camels here humorously demonstrate) on a day when the sun rose and set like any other. Miracles take place (far more often than, ‘common sense’ will allow) against the background of every day events. 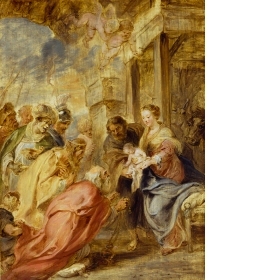 Rubens manages to make each of the individual characters in the scene vividly present. I feel as if I could walk directly into this company and be made welcome. Andrei Rublev’s Icons and Frescos are supreme works of devotional art. They are works to be still before. If you surrender to these works they will work in your soul. 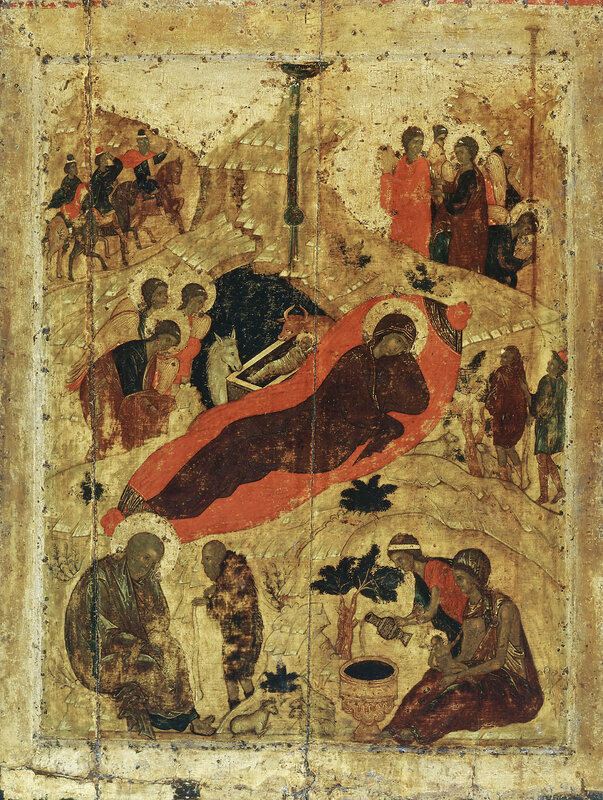 Rublev, following the Orthodox tradition, sees the events of The Nativity not as historical episodes but as living events the faithful community participated in as they celebrated the liturgy. The calm and peace of the image contains immense and complex feeling. 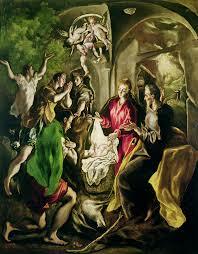 The birth of The Saviour is shown as a cosmic event which is yet an acceptance of human mortality and frailness. 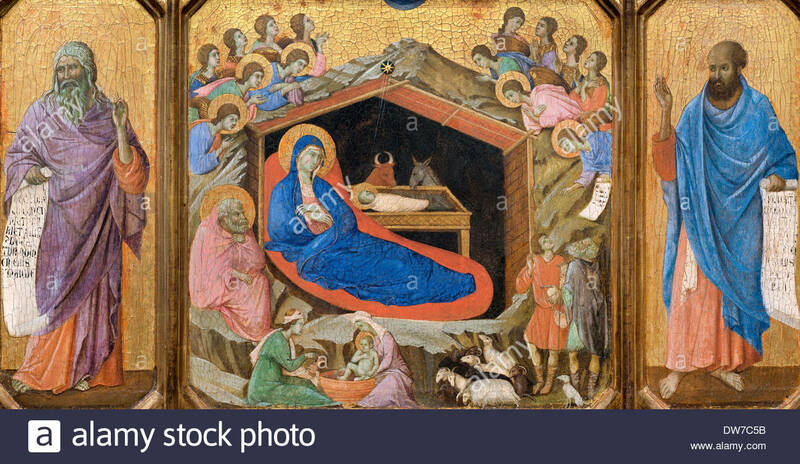 From the great Master from Sienna, Duccio Di Buoninsegna. Since I first discovered the work of Duccio as a teenager I have been in thrall to the luminous beauty of his works. His paintings seem to me to have been deeply pondered in his heart which gives them qualities of stillness and humility which I find overwhelmingly moving. In particular, something about, ‘Duccio Blue’ sets my heart aflame. This entry was posted in Christmas, Paintings and tagged Andrei Rublev, Duccio, El Greco, Peter Paul Rubens by Thom Hickey. Bookmark the permalink. Nice to see that your interests extend to art and painting. I couldn’t have selected better works. Good to hear from you and your good wishes returned!